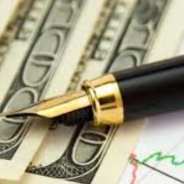 The following are examples of grant writing projects from across the United States. 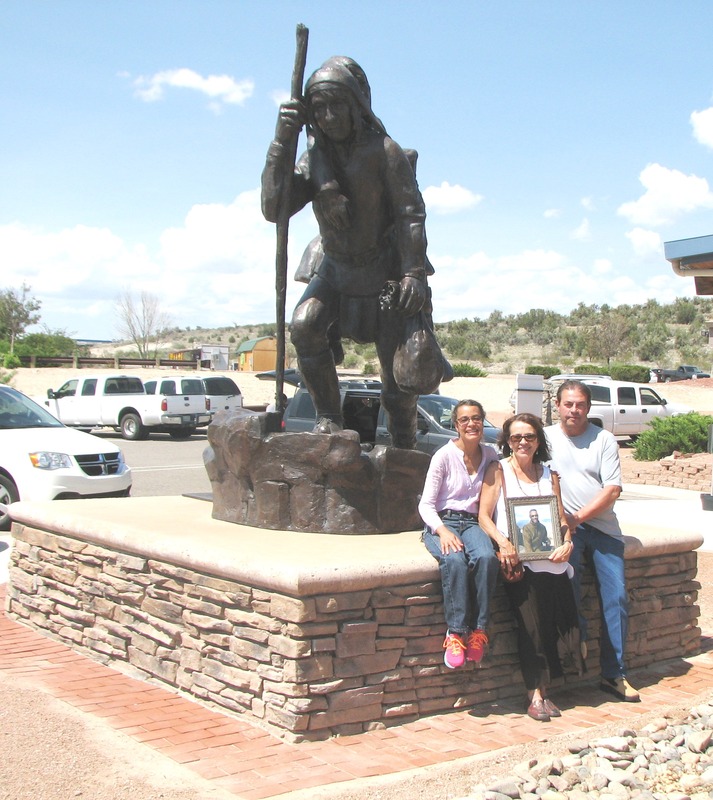 Funded by the Arizona Office of Tourism’s Rural Tourism Development Grant Program, this multi-year project was inspired by the late Patrick Gorlick (pictured in the 8 x 10″ photo held by Jyoti Gorlick, Patrick’s wife) telling Michia the Yavapai-Apache Nation’s historic Exodus story in 2007. The Yavapai-Apache Camp Verde Reservation was established by an Executive Order of President Ulysses S. Grant November 9, 1871. On February 27, 1875, the United States Army, acting on a new Executive Order from Grant, moved approximately 1,500 Yavapai and Dilzhe’e Apache against their will from the Rio Verde Indian Reserve to the Indian Agency at San Carlos. This forced removal, and the subsequent closure of their reservation, resulted in the passing of hundreds of our Yavapai and Apache ancestors, as well as the loss of thousands of acres of land holdings promised by United States government treaty. Under Indian Commissioner, L.E. Dudley’s, direction and that of U.S. Army troops, the Yavapai and Dilzhe’e Apache people were forced to march in harsh winter conditions over mountain trails, which forded flooded rivers and streams. Dudley chose to make young, old and infirm walk through the mountain passes and narrow canyon trails to San Carlos instead of transporting the sick and elderly with the supplies via existing wagon roads. In 1875, William Henry Corbusier, Medical Department, United States Army, began journaling – and recounting through frequent “fireside chats” with his family – the period of time from approximately 1869 to 1888. Since he worked with the Yavapai and Apache as a doctor during their internment on the Rio Verde Reserve, then traveled with them – at their insistence – during their forced exodus, he felt strongly that the story needed to be accurately told. In 1969, the book From Verde to San Carlos: Recollections of famous Army Surgeon and His Observant family on the Western Frontier 1869 – 1886 was published by William Corbusier’s son, William T. Corbusier. Recollections in this book are told from the perspective of several different Corbusier family members and it was the doctor’s wife, Fanny Dunbar Corbusier, who first recorded the details of the Yavapai-Apache gentleman bearing his wife. From Chapter 15 of the book, entitled “Treachery, 1875”: “The doctor and his family stood on a low mound and watched – quoting mother: …as the long, silent, and sad procession slowly passed. They had to carry all their belongings on their backs and in their V-shaped baskets (ku-thaks), old and young with heavy packs. One old man placed his aged and decrepit wife in one of these baskets, with her feet hanging out, and carried her on his back, the basket supported by a band over his head, almost all the way. He refused help, except over several stream crossings, where he was persuaded to allow a trooper to take her across on his horse. Over the roughest country, through thick brush and rocks, day after day, he struggled along with his precious burden – uncomplaining.” (p. 270, 1962). The Yavapai and Dilzhe’e Apache were held in captivity at San Carlos for 25 years. Once released, only about 200 returned home to the Verde Valley. When they arrived, they found their treaty land had been taken by Anglo settlers, and there no longer existed any place for their residence. Nonetheless, in 1909, the original reservation was reestablished and additional lands were acquired in the following years. The tribe organized under the Indian Reorganization Act of 1934 approving its constitution and bylaws in 1937. In 1992, the tribe’s name was formally changed to the Yavapai-Apache Nation, which now reenacts the historic exodus in the annual Exodus Day 1875 Removal – 1900 Return commemoration. 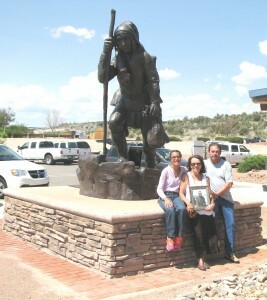 MGT’s funding of the $50,000 Rural Tourism Program Development Grant allowed the YAN to complete Phase I in a three-phase project with the overarching goal to construct a 9’ x 6’ sculpture, which forever depicts in bronze the courage, bravery and fortitude of the elderly Yavapai-Apache gentleman who carried his invalid wife on his back in a v-shaped “burden” basket through winter snow across flooding rivers and over treacherous mountain trails during the exodus from the Rio Verde Indian Reserve 180 miles to the Indian Agency at San Carlos. An additional testament to the Nation’s commitment to preserve its culture and history, the project took seven years to complete from the August 2007 grant submission date until the sculpture’s unveiling during the February 2014 Exodus Day commemoration. MGT helped the Nation develop a list of 15 renowned Native American sculptors from the Southwest to as far north as Alaska, and the Nation sent a Request for Qualifications (RFQ) to each of these individuals. When the first RFQ failed to garner any inspiring proposals, MGT revised the Nation’s RFQ, and sent it out to the sculptor, who had provided hours of guidance and expertise on MGT’s grant development, Doug Hyde (pictured above right). Although Doug had been entirely too busy completing sculpture commissions for tribes across the U.S. in 2007, as time passed, his schedule opened up and he responded with the sculpture proposal that captured the attention and support of the Tribal Council. The rest, as they say, is vitally important history. In 2016, MGT funded a $264,495 Federal Transit Authority Tribal Transit Program grant for the Craig Tribal Association to purchase two 20 + 2 body-on-chassis buses. Grant funding will complete Phase Two of the Prince of Wales Island Public Transit System and initiate local demand response bus service in Craig and Klawock, and demand response regional bus service on a Craig-Klawock-Hollis route. Also back in 2008, MGT funded a $81,944 Administration for Native Americans Social and Economic Development Strategies (SEDS) grant to update the policies and procedures manuals for the Yavapai-Apache Nation’s Health and Human Services Department. The grant was one of 59 U.S. SEDS grants funded for FY08 during which only 39% of the 332 applications received funding. A Round 14 Transportation Enhancement Program grant, Michia funded this $164,719.00 off-system project for the Town of Pinetop-Lakeside during her term as the Town’s first Grant Coordinator. The grant application ranked 1st among 8 off-system projects selected by ADOT during the 2nd review for funding.